I’ve wanted to launch a journal for my website for a while to write about trips that I’ve been on, help answer any questions I get from my Instagram community and also so that I can just improve my writing skills. I’m a 20 year old French photographer whose spent the last two years travelling and developing my skills and career as a creative. I’ve always loved going on adventures and grew up in a family that would spend most of the summers camping in the French Pyrenees or Massif Central. When I look back at my 16 year old self I realise just how ‘Not Normal’ I was, constantly trying to head off on adventures when I should have been stuck playing computer games. Funnily enough at one point I did have a xBox but I sold that to buy a tent, at this point I knew I was going to be pursuing adventures in my life more than anything else. Currently i’m focused on skiing and climbing and hope that in the next 5 years I have the chance to climb in some unique mountain ranges around the world such as Alaska, New Zealand, Greenland and Patagonia. If along the way I could lead some first ascents or new routes that would put a grin on my most likely frozen face. BTS from a shoot for Serre Chevalier Tourism board. Ever since I was 16 I just had this thought in my mind that the moment I could drive drive I’d be able to head off one road trips, I didn’t really care what car I owned at this point but if it could get me to the mountains it would do the job. With this idea set in stone in my mind I made sure that as soon as I legally could I pass my driving test, I would. Of course in the process of rushing I failed my theory once but oh well, I’m here now with 3 years of driving experience and currently fingers crossed no crashes, except the numerous times I’ve got stuck off roading in non 4x4 vehicles. I didn’t even have a car but started borrowing my dad’s old Citroen Berlingo which I made a basic sleeping platform that would fit over the folded seats, it was tiny but it was my first taste of taking a vehicle and going on road trips and I loved it! I spent two weeks on the road across the Pyrenees in Spring 2016 exploring valleys, hiking and just learning how to shoot photos and edit them on the road. I even made daily Vlogs and even though when I look back at the videos it makes me cry with laughter how bad they are I’m so glad I have them as a memory. If for some crazy reason you wanted to watch these and meet 17 year old me on the road then below there is the YouTube playlist for the video series. Dinner served on the fold out table and my bed behind it. I powered most of my electronics from this solar panel and edited on the road. I came back from that trip more inspired and driven than ever to explore my photography and filmmaking as well as working and travelling. I went back to my job in a ski shop called the North Face / Ellis Brigham in the UK and started saving for my Gap Year. Shortly after buying my first van, winter approaches and i’m starting to convert the van for my ski season. When it came to my gap year I knew I wasn’t doing the classic travel plans to Asia so instead I decided to spend 3 months touring Europe in winter going from ski resort to resort. I knew for winter I’d need a little bit of a better sleeping system as the last build was fine for summer but would have been a bit grim in -15 degree temperatures. So the search for a van started! With the search for a van on, I spent around a month constantly searching ads and trying to get insurance quotes. Finally I found a 2005 Citroen Dispatch van that wold be my home on wheels. I remember struggling so much to get a insurance quote let alone get one I could afford. My dad helped me go through quote after quote and eventually I found one that would cover a 18 year old on the smallest of panel vans. It cost a stupid amount of £2000 but seeing as I had friends paying £1500 for little cars I knew that the van was worth it for the adventures it could take me on. I converted the van out every evening after work in the ski shop and at weekends. Only finishing the build on the day I was due to catch my ferry to France. I remember by best mate Toby came round for moral support and a catch up before I went away for 3 months, we ordered Pizza and found it hilarious that I was still building the van and that my ferry was later that evening. You can probably guess that I missed that ferry and had to get a later one. After spending 80% of my budget on the van, conversion and insurance I was pretty dubious how I’d spend 3 months living on the road. I basically would arrive at ski resort and talk to the tourism board and exchange my photography skills for a free ski pass! 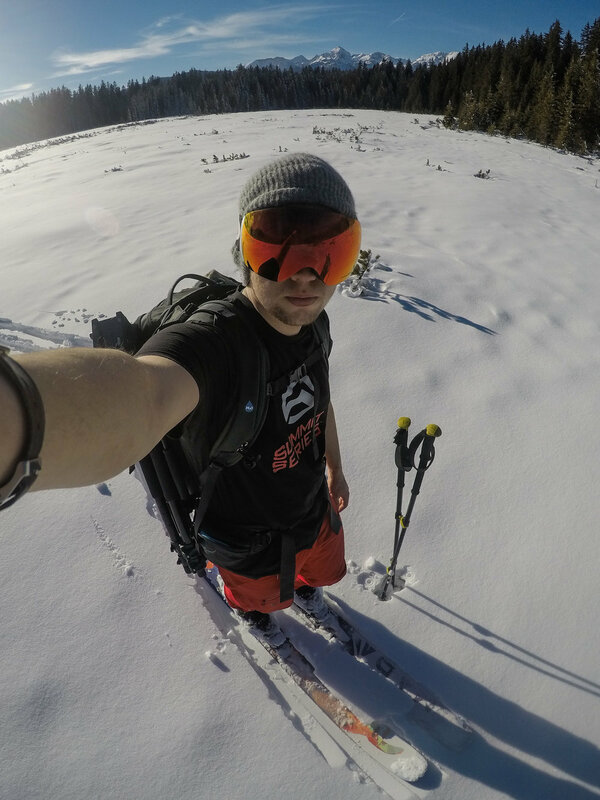 I’d provide photographs and videos for social media and in return I could ski all day every day, I even managed to get in some cat skiing trips, snowmobiling and night skiing at some of the resorts. It was a dream come true and I didn’t quite know how it had happened but I realised that photography was a tool that would allow me to be in the mountains and exploring so I made it my number one priority to explore this possible career path. Over the next two years I took my trusty van ‘Ellatherollinghome’ on so many new adventures. Somehow my best friend Toby and I ended up living at my French family’s house on a little island on the West coast of France, we paid bills to my parents and spent our time dedicated to photography and learning to surf. I’m going to write a journal about my time living on the island so I’ll keep that story for another time. So after two years of travels around Europe in my van and a month in New Zealand whilst constantly working as a freelance creative, I started to think about a bigger van to enable me to live more comfortably on the road and have 2 people living easily in a vehicle. Eventually I put the trusty old van on the market and sold it to it’s new owner, it was a nostalgic moment but at the same time I new it was the beginning of a new build and adventure. The hunt started all over again for a new van, but this time I knew a little more. One could say I was a season-aired van hunter! I knew I was looking for a Sprinter van for the size and reliability of the vehicles. After looking at a few vehicles and heading to my local Benz dealer an ad caught my eye just a few hours from my parents home in the UK where I was currently living. A 2015 sprinter with only 55k miles on the clock and a reasonable price. Genuinely the ad looked to good to be true, both my dad and myself said whilst driving to check it out we reckon it will have something that scares me away from the buying it, either a dodgy bit of paperwork or the photos would have been hiding something but no it truly was as the ad described it. After spending an hour underneath the van inspecting every corner of the van, exterior, interior and engine bay it passed my checks and we decided to take it on a test drive. When we pulled back into the garage I’d decided that it was the one, so we sorted the paperwork and the new van project started from then onwards. I’ll be writing journals sharing the progress of the van so stay tuned for that! For now meet Miska, which means “Little Bear’ in Alaskan the sprinter van that I’m building into a adventure home on wheels. 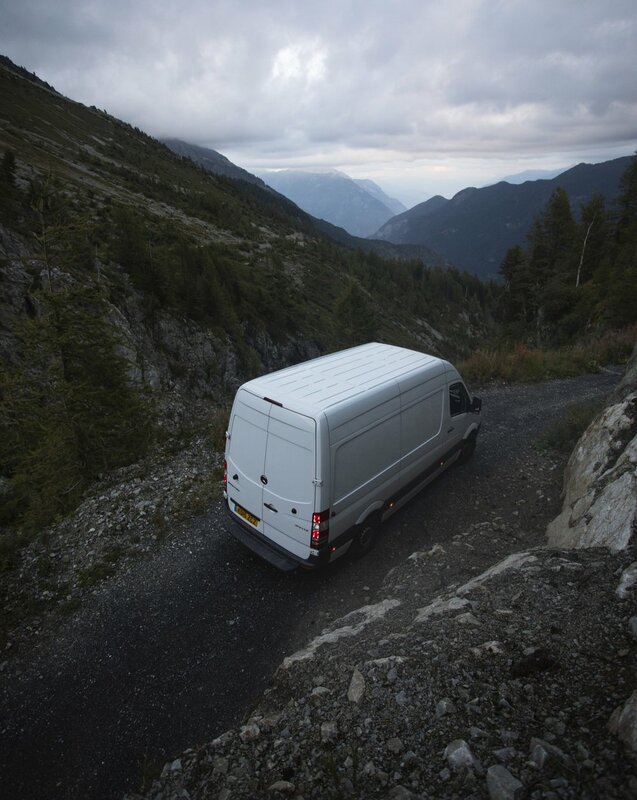 Miska the Sprinter van parked up in Chamonix during the Autumn of 2018 whilst I was working for EpicTV. Off-roading down little mountain roads in Switzerland. At the same time I was preparing to start university. Yes, I’d decided I wanted to try out student life, studying Physical Geography in North / West Wales. My plan is to build out the van so it’s ready to live out of for second and third year of uni with the aim of being able to be rent free and come out of uni with a home! After uni the rough plans are drive the van over to Europe and spend a few years pushing my climbing and skiing to a new level after that I have an idea of potentially shipping the van to Canada or America and undertaking the Pan-American Highway hitting up famous mountain ranges along the way, but that’s a while away so lets see where things go. Thanks for reading this first journal, I hope you enjoyed learning a little about what I’ve been up to over the last two years!